.NET Framework is a managed execution environment that provides a variety of services to its running applications. It consists of two major components: the common language runtime (CLR), which is the execution engine that handles running applications; and the .NET Framework Class Library, which provides a library of tested, reusable code that developers can call from their own applications. · Memory management. In many programming languages, programmers are responsible for allocating and releasing memory and for handling object lifetimes. In .NET Framework applications, the CLR provides these services on behalf of the application.· A common type system. In traditional programming languages, basic types are defined by the compiler, which complicates cross-language interoperability. In the .NET Framework, basic types are defined by the .NET Framework type system and are common to all languages that target the .NET Framework. · An extensive class library. Instead of having to write vast amounts of code to handle common low-level programming operations, programmers can use a readily accessible library of types and their members from the .NET Framework Class Library. · Development frameworks and technologies. 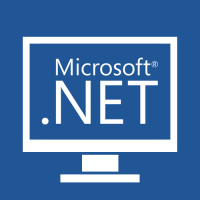 The .NET Framework includes libraries for specific areas of application development, such as ASP.NET for web applications, ADO.NET for data access, and Windows Communication Foundation for service-oriented applications. · Language interoperability. Language compilers that target the .NET Framework emit an intermediate code named Common Intermediate Language (CIL), which, in turn, is compiled at run time by the common language runtime. With this feature, routines written in one language are accessible to other languages, and programmers can focus on creating applications in their preferred language or languages. · Version compatibility. With rare exceptions, applications that are developed by using a particular version of the .NET Framework can run without modification on a later version. · Side-by-side execution. The .NET Framework helps resolve version conflicts by allowing multiple versions of the common language runtime to exist on the same computer. This means that multiple versions of applications can also coexist, and that an application can run on the version of the .NET Framework with which it was built. · Multitargeting. By targeting the .NET Framework Portable Class Library, developers can create assemblies that work on multiple .NET Framework platforms, such as the .NET Framework, Silverlight, Windows Phone 7, or Xbox 360. · To provide a consistent object-oriented programming environment whether object code is stored and executed locally, executed locally but Internet-distributed, or executed remotely. · To provide a code-execution environment that minimizes software deployment and versioning conflicts. · To provide a code-execution environment that promotes safe execution of code, including code created by an unknown or semi-trusted third party. · To provide a code-execution environment that eliminates the performance problems of scripted or interpreted environments. · To make the developer experience consistent across widely varying types of applications, such as Windows-based applications and Web-based applications. · To build all communication on industry standards to ensure that code based on the .NET Framework can integrate with any other code.